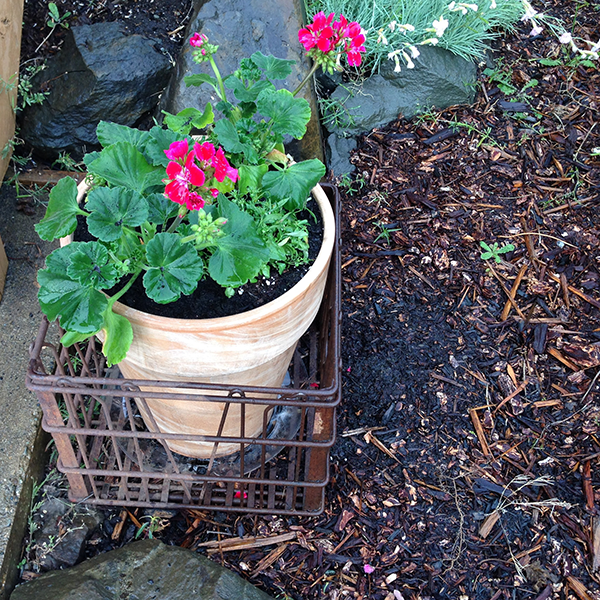 Vintage Metal Milk Crates Go Curbside! No, it’s not what you might think? Sadly, we aren’t getting our milk delivered to our doorstep in old glass milk bottles carted in vintage metal crates… but we can wish! It all started with a quick little thrift, and somehow I ended up with these! 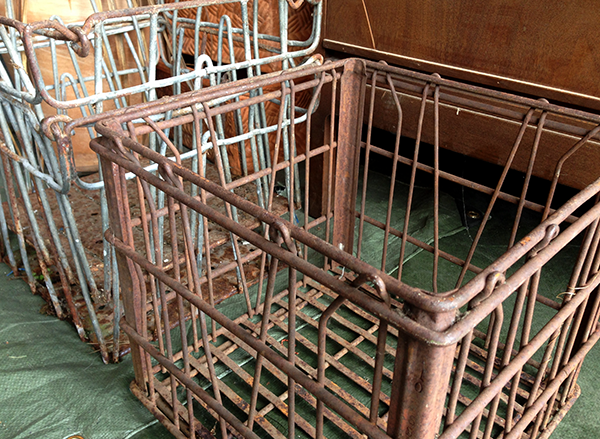 The shop keeper was so great – he told me he remembered these crates from when he was just a kid. His family owned a corner store, and the milk used be delivered in crates like these. The one in the foreground is apparently older, he thought from at least the early 1950s. If you notice, the top and bottom are different than the ones in the background. On the left are two crates, one stacked inside the other, and do you see the round ends at the top of each corner? Now check out the top of the lone 1950s crate. No round ends at its upper corners. According to the shop keeper, the stacked crates are from the mid1960s and were purposefully redesigned to better accommodate storage. 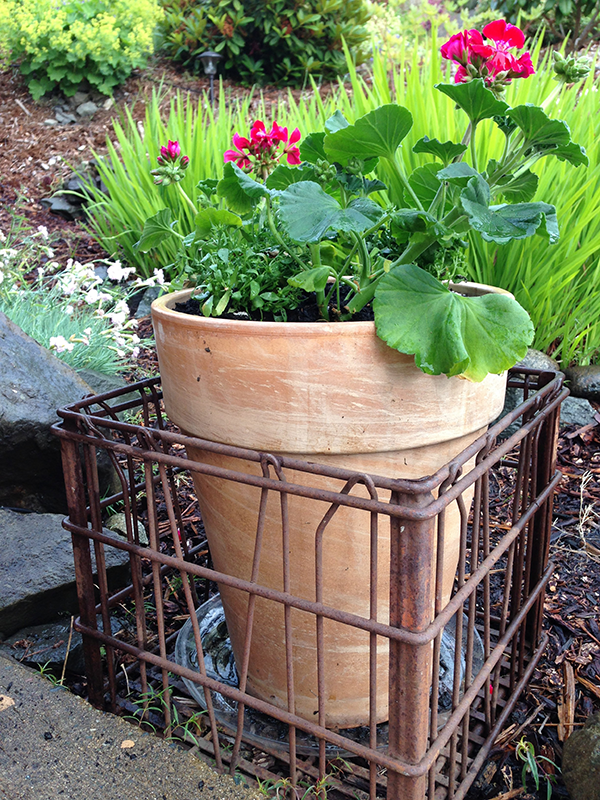 Here’s a bird’s-eye view of both vintage crate styles. Can you see the bar sitting towards the inside top of the left crate? The 1960s crates were designed with two bars opposite each other at the top. The purpose of the round ends I mentioned earlier was to enable the bars to slide, and this was so the crates could stack one inside of the other when empty. If you look closely below, you’ll see a slight taper to the profile of the 1960s crates compared to the 1950s design. In this image you can also see how the bars slip in and out of place, and that when they narrow up they also dip lower. This creates a ridge for the top crate to sit down into. Both styles of crates were designed to stack. The problem was transporting and storing them when they were empty. You see, the 1950s crates took up the same storage space whether empty or full, and were cumbersome to move. 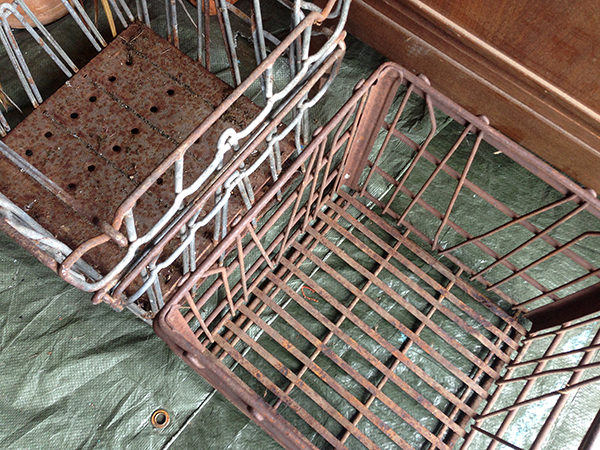 With the improved 1960s design, not only did the crates stack better when full, but the sliding rods allowed them to stack inside of each other when empty making carting and storing a lot easier! The shop keeper told me storage was always a problem, especially with the 1950s style, and that any overflow of empty crates simply got left outside. Hmmm, can you tell? 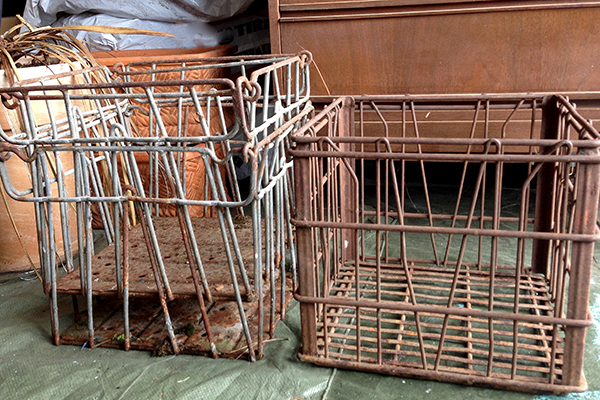 I fell in love with the 1950s crate on the spot, and really wanted a few more. But when I looked around all I could see were crates that had been painted black. 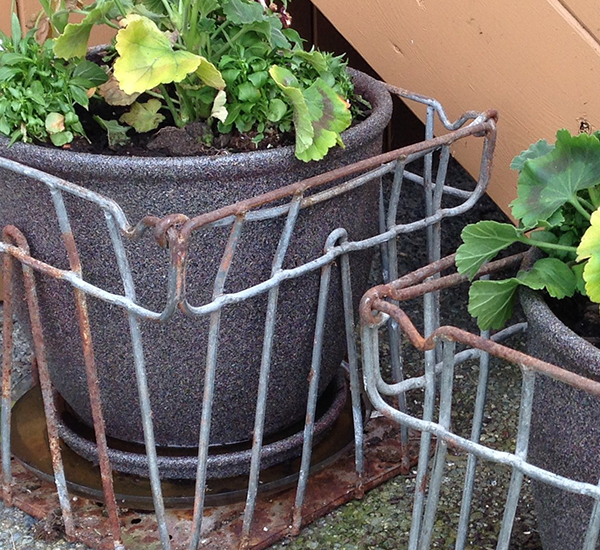 Now I love my black, but in this case I love weathered and rusty more. It just so happens my friendly shop keeper had what I was looking for… he just had to fetch them from out behind his storage shed, grass, dirt and all! 😉 Love it!! I do love rusty ‘old’ things, and if you missed it, I wrote about ‘that’ crush here! How about you? For the love of vintage, do you prefer your pieces to be aged and old, or DIYed to look new? These are so pretty – I love them with the flowers inside! And I LOVE shops where the owners know all about their products – I never knew there was so much to know about milk crates! Aged and old for sure! 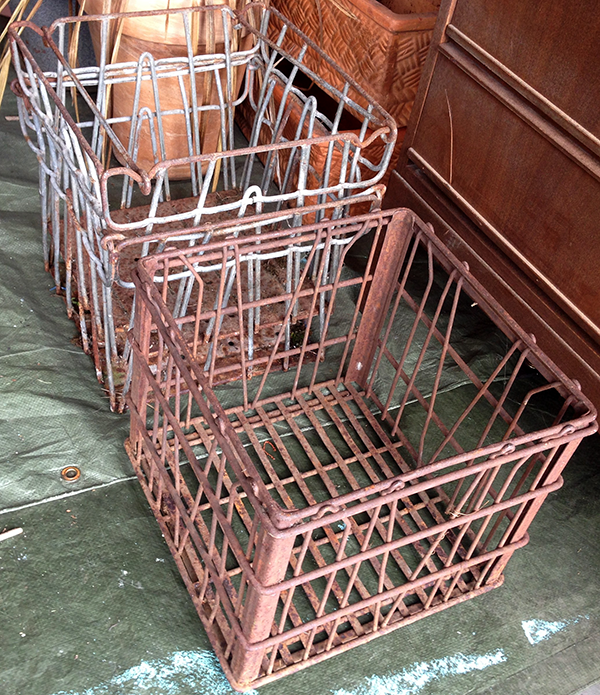 The crates are beautiful Sheila, good score and neat history! 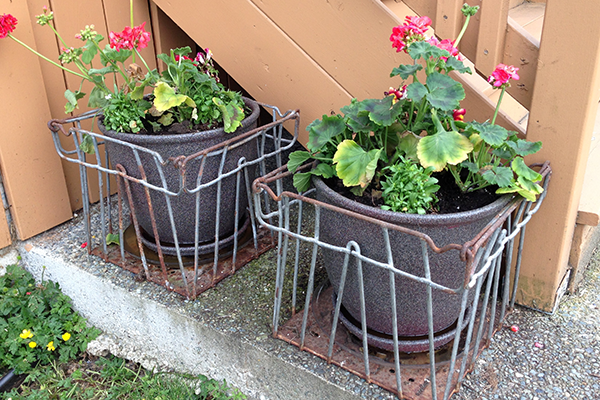 I like them as planter holders too, they fit perfectly! YOU know I love rusty! These are making me drool, I adore them and want them!!! I love them too! Clever to add flowers into them!! Love me some old and rusty!!! You so know I’m all over this story!!!!!!! You have just made them pretty once again! Love them Sheila! Great find. Next PostNext On Set. Can You Locate Audrey?